Goodspeed Update | Crowdfunding Urban Infrastructure: Can It Be Done? Crowdfunding Urban Infrastructure: Can It Be Done? “Crowdfunding” refers to the use of the internet to raise money from a large group of people for a cause. The canonical example is Kickstarter, whose donors have pledged over $230 million since its founding for a variety of creative projects. Although most Kickstarter projects seek only a few thousand dollars, seven have raised over $1 million in donations to go towards projects to create new products, record music, print a comic book, and design new video games. With the political climate in many places remaining hostile to new taxes, and cities in need of infrastructure investment, many are considering whether the principles of crowdfunding can be applied to urban infrastructure investment. Two projects I have heard about are doing just that, and I suspect many more are waiting in the wings. An entrepreneur working in Boston is developing an idea to create a crowdfunding platform for “urban improvements.” Designed to be deployed at a small scale, the target could be small-scale neighborhood improvements or loans to local businesses. The entrepreneur is exploring connections with neighborhood groups and refining his business model before going public. A project that launched this week is already collecting donations for urban infrastructure in the heartland. A friend of mine in Kansas City was frustrated when a public meeting about a planned streetcar line devolved into a debate about the proposed funding mechanism — a property assessment along the streetcar’s route. He’s launched neighbor.ly, a civic crowdfunding platform launched this week with two initial projects: $10 million for the streetcar and $1.2 million to expand the city’s bike sharing system. 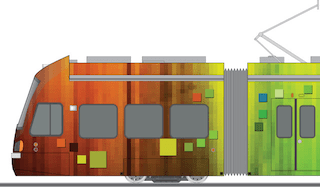 In exchange for giving money, donors can receive tokens of appreciation which include “pixels” on the side of the light rail cars (illustrated to the right), or a variety of free perks to use or advertise on the bikes. Donors have already pledged over $400,000 towards the bike system, although most is apparently from a large health insurance company. Only time will tell whether these initiatives will raise the “real money” needed for public infrastructure. I suspect naysayers will be proven wrong and they will meet with some success for two primary reasons. First, they’re part of an ongoing revolution in public finance towards funding sources closer to the direct beneficiaries of public investments and away from federal and state sources. This interesting article notes more and more transportation infrastructure is funded by “local option taxes” and many of the new light rail systems have been largely funded by local or regional sales taxes (Including in Denver and North Carolina). The second reason civic crowdfunding will succeed is that it follows a broader ideological shift away from taxation and traditional public finance. The right will like it since it reduces the reliance on mandatory taxes, and the left will like the ersatz grassroots character. Although decentralized, crowdfunding will inevitably result eventually result in tension between donors and elected officials, who presumably will retain permitting authority. This issue can be seen in Detroit, where private donors who pledged $80 million for a new streetcar argued for a curbside alignment while planners sought a more efficient alignment in the center of the street. The logical culmination of postmodern public finance may be aided by the Jumpstart Our Business Startups (JOBS) Act. Up until now, crowdfunding payments have been nothing more than donations, although the JOBS Act liberalizes federal rules to allow for equity crowdfunding for private startups. This will usher in an interesting period of financial innovation, and will theoretically make possible crowdfunded public private partnerships (PPP). Like with fee-for-service and local donation schemes I discussed in a previous blog post, these ideas inevitably raise equity concerns. Will only wealthy neighborhoods — and cities — be able to fund public investments? Will funders only give to flashy investments (like bikes and streetcars) while the prosaic (and hidden) infrastructures like water and sewer lines crumble? To a certain extent, existing funding mechanisms already results in these problems. Perhaps public agencies can get ahead of the trend, requiring a portion of all crowdfunded donations be reserved for investment in low-income areas, or spent on agency-determined needs. Only time will tell whether projects like neighbor.ly will result in a major new trend for funding urban infrastructure, or remain a whimsical footnote only useful in certain contexts. ← Which Cities Create Comprehensive Plans? Thank you for writing about this Rob. You raise several valid points about issues that need to be resolved as the crowdfunding revolution makes its way into civic matters. What’s not mentioned in this post (but is well addressed in other works of yours) is the poor health of municipal finance in general. Cities across the nation face massive budget deficits. Many cities are addicted to debt, issuing more bonds than can be covered by their future tax base. Especially true in shrinking cities– some continue to add bond debt until they’re no longer even evaluated by ratings agencies. In such places ‘the music stops’ and nearly everyone loses. In the case of Neighbor.ly, our intent is to help civic entities create down payments on larger infrastructural projects. It’s not imagined as a substitute for necessary taxes but instead a complementary potential revenue source for very specific kinds of projects. Most especially infrastructure projects that can add value to the a city’s economy, sense of place, and quality of life, yet face a difficult time passing as a tax matter during down times. Approaching the problem in this way is not unlike buying a house. The bigger the down payment, the less money you need to borrow AND the better rate you get on what principal you do end up borrowing. Pre-capitalizing civic amenities brings at least two advantages: it helps get contentious deals done, and frees up cashflow down the road as the city pays less in interest costs. That can be cashflow for less flashy but critical line items like water, sewer etc. Thank you for the thoughtful treatment and helping the rest of us think through the tough questions around competing interests, equality and legislation. Looking forward to further works from you on the subject. can a town planning council raise an IPO and list on a stock exchange?